In 2014 Richard Dawkins’ tweet ‘abort it and try again’, on babies with Down syndrome, spurred a storm of protests around the globe. 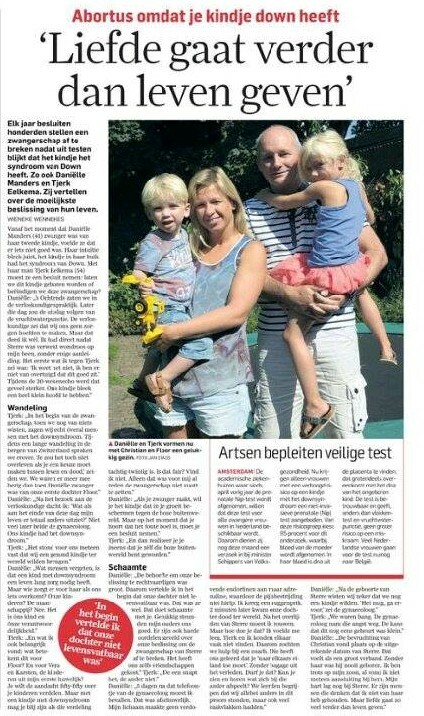 This year when a National Dutch newspaper featured a couple who did just that, the silence was deafening. Many people view screening and selection as a personal choice, but decisions that governments make affect how societies deal with differences (in culture, race, colour, religion, ability, etc.). The Netherlands offers screening to enable selection for Down syndrome as part of its’ public healthcare system. The Netherlands is the first country to offer the Nipt (Non invasive prenatal test) primarily aimed at Down syndrome as a pilot program under the national screening program. The UK and other countries are considering introducing the Nipt. Austria, however, strictly avoids a national screening program for Down syndrome and other aneuploidies “because doctors and the national health service are NOT interested in terminating as many handicapped individuals as possible1)”. Every year hundreds of couples decide to terminate their pregnancy after the child is diagnosed with Down syndrome. So did Daniëlle Manders and Tjerk Eelkma. They talk about the most difficult decision in their lifetime. From the moment Daniëlle Manders (41) was pregnant with her second child, she felt something wasn’t right. Her intuition was correct; the baby in her womb had Down syndrome. With her husband Tjerk Eelkema (54) they had to decide: will we have this baby or terminate pregnancy?